Food safety and hygiene govern everything that you will do within the catering industry. No matter how great a product may taste, if it has not been prepared, stored and served to a legally-set standard its consumption could lead to injury, illness, or even death. But don’t worry, good food safety and hygiene practices aren’t all that difficult to follow; just stick to the rules set out in this course and your kitchen will remain a happy, healthy, safe place to work. 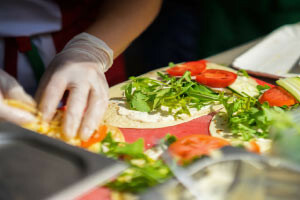 By the end of this course, (and the successful completion of the end of course assessment), you will have received all of the appropriate training required to work legally, safely and hygienically in a food-handling environment. If your place of work doesn’t fall into one of these categories, don’t worry. As long as your job involves the handling and/or serving of food, this course will be relevant to you. Throughout this course, we’ll be discussing the two main areas of good food handling practice: Food Safety and Food Hygiene. Discuss the main food-borne illnesses and how they may affect us. Explain the most common source of food-borne illnesses. List some allergic reaction symptoms. Describe some of the responsibilities food handlers must implement. Define what HACCP stands for. • List the 7 principles of HACCP. Describe different types of hazards that can affect food safety. Explain ways to control bacterial growth.